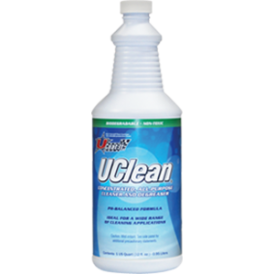 UClean is the ideal product for maintaining your UCoat It floor. 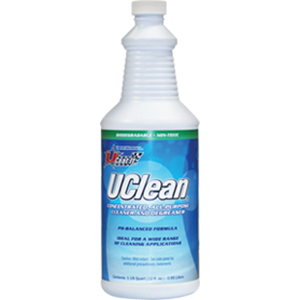 UClean is a pH-balanced, synthetic, all-purpose cleaner guaranteed never to dull, haze or leave behind an oily film. When used on hard, high-gloss surfaces, the soil-busting ingredients emulsify all oil-based soils. Soils are suspended and easily wipe free of the surface being cleaned. Safe for use on all UCoat It finishes. 1 Qt. Concentrate. Dilute up to 30:1 for general cleaning.